A devil; another classic Halloween costume that is favoured year after year. 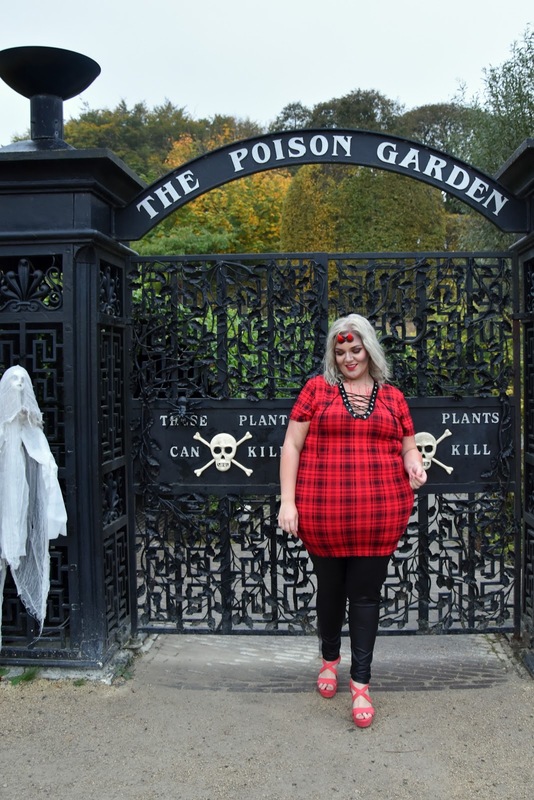 Due to its popularity, its no surprise that I chose to feature this red based look as part of my new youtube video; a plus size autumn fashion lookbook with a halloween twist! 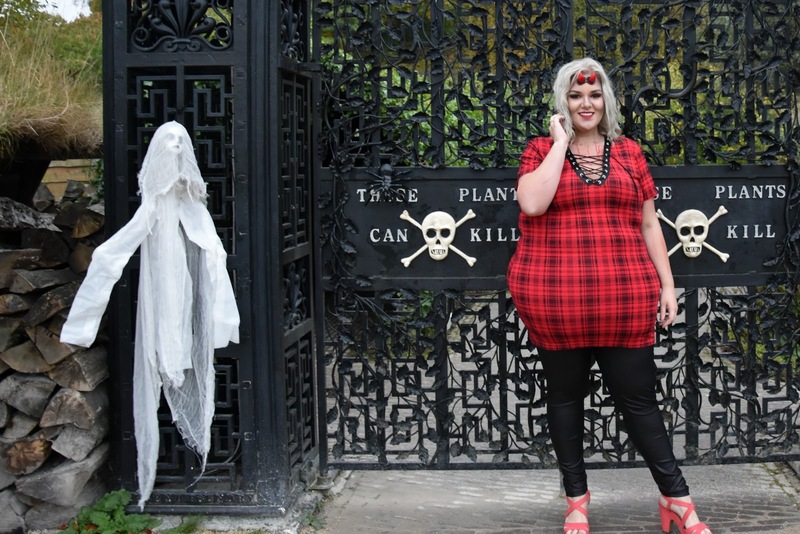 I picked out some key pieces from plus size fashion retailer, Yours Clothing, that I think will make gorgeous Halloween outfits as well as being a great addition to your autumn/winter wardrobe. Choosing an outfit to wear on All Hallows Eve needn’t be about spending a fortune on a costume; you can take something that’s already gorgeous and give it a spooky twist. Quite like what The Alnwick Garden have done amongst their vast grounds. You can take a look around the spooky makeover it has been given in my new video but for now, lets get back to the fashion. Red is big business right now. It is a colour that featured heavily on the catwalks for this season and that’s why you’ll see a lot of it over the coming months. 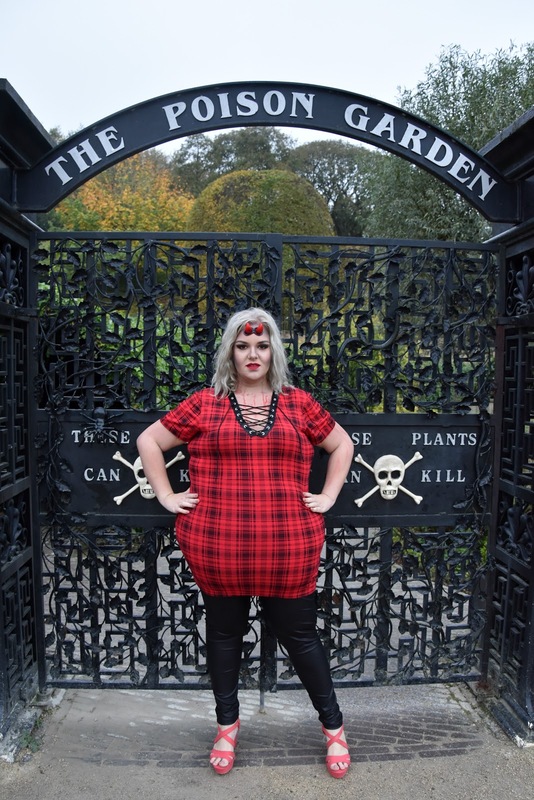 If you’re wanting to go bold and make a statement with red then the Limited Collection Red Checked Lace Neck Longline Jersey Top from Yours Clothing is a fantastic option. Featuring a lace up detail to the bust, its fun, playful and adds a certain edge to the stretchy checked top. I tend to find Yours Clothing tops to be generously sized and cut at just the right length. They’ve got this piece in particular spot on as it is more than long enough to cover the bottom making it an ideal candidate to be paired with any number of options on the bottom half. It would sit smoothly under a skirt or high waisted jeans and since it reaches past the bottom, it works very well normal leggings or the gorgeous Limited Collection Black Leather Look PU Leggings that I have on here. These leggings are absolutely fantastic if you’re looking for an alternative to wearing the usual leggings, jeans or trousers. They look expensive, really stylish and the gorgeous eye-catching sheen on the fabric has a smoothing effect which is really flattering. I’ve worn mine on countless occasions both day and night and they’re definitely one of my top picks for the autumn and winter months. To complete the look, I added a slick of MAC Lipstick in the shade Ruby Woo to my lips, and some coral red platform heels. I love the look of high heels but I really struggle to be able to walk in them so chunky platforms are always the way forward for me! 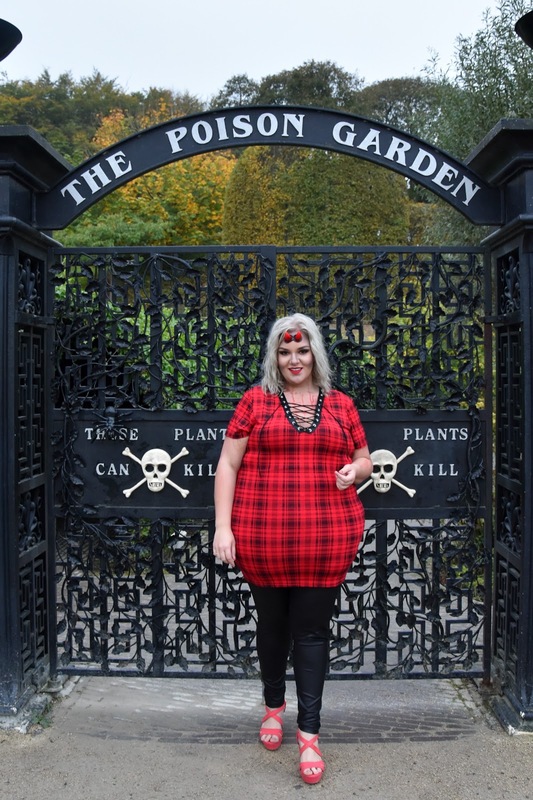 Don’t forget to check out my new plus size autumn fashion video here and check out the links below to shop this look and for more outfit inspiration.